The nose has lemon, lime, pear, and balsa wood, with a hint of old wooden furniture. The mouthfeel is thin with no cling. The body has pear, lime, balsa wood and green apple. The finish has lime and green apple. Water brings out tight, thin whorling that settles quickly into brief mottling. The nose gains more pear and loses some of the lemon and lime. The body gains more pear and loses the lime, but the lemon remains. The finish gains some pear and the lemon is a little diminished. 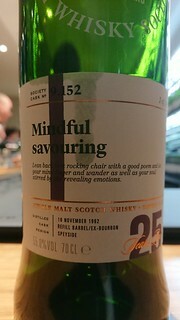 A very fine dram, more lively than its age suggests.